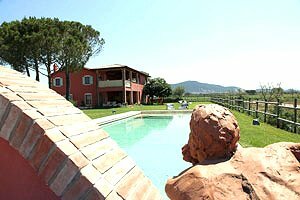 The villa is set in the heart of Maremma, the area in southern Tuscany renowned not only for its beautiful beaches, since decades the favourite seaside destination of many VIPs, but also for its "butteri" (this is how Maremma cowboys are called in Italian), its cuisine based on wild-boar dishes and its excellent wines (as the famous Morellino di Scansano). 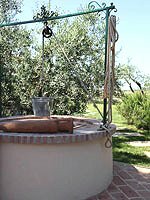 A land rich in Etruscan and Roman settlements, Maremma has retained its wild character, and with its three parks and its twenty-one nature reserves can be defined a real natural oasis. 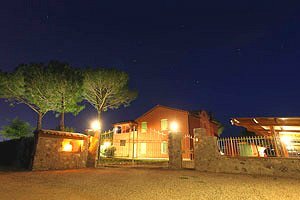 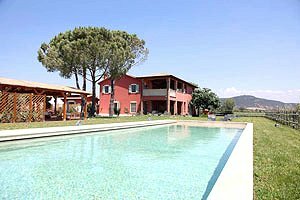 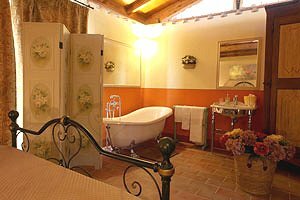 The villa furnished in country style is a typical Maremma country house located halfway from Grosseto to Campagnatico. 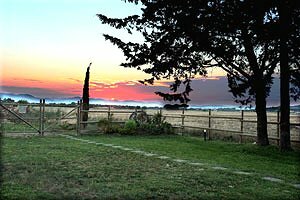 Close to the estate are some important Etruscan necropolises, Ombrone Fluvial Park and Maremma Natural Park, as well as a riding stable and a golf club. 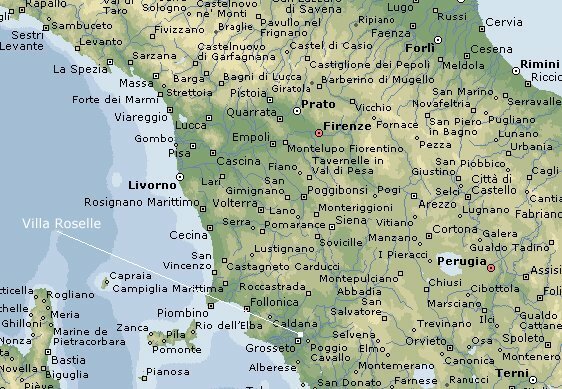 Some of the most renowned Maremma seaside resorts are within easy driving distance. 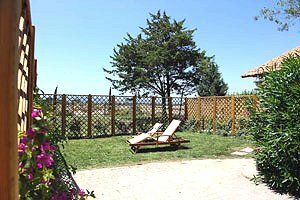 The wide fully-fenced park that surrounds the villa is furnished with a table and some chairs for guests to have meals in the shade of the many century-old long-stemmed trees scattered in the garden. 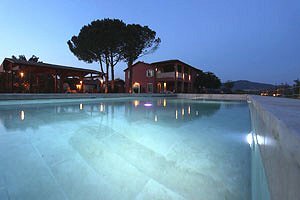 About 15 metres from the building lies the private swimming pool (5x15 m; depth: 0.30-1.35 m), equipped with underwater sun loungers and a night lighting system. 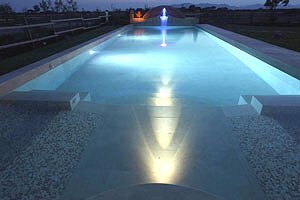 A stereo system plays background music by the pool side. 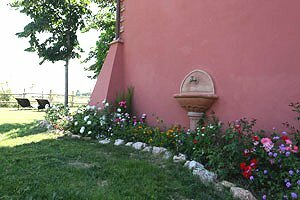 During the summer a keeper takes care of the garden and keeps the swimming pool clean without interfering with the guests' privacy and the exclusiveness in the use of the swimming pool. 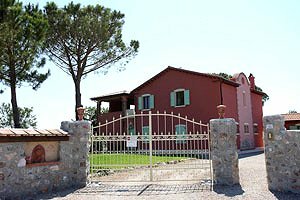 The guests of the villa can contact the keeper in case of need. 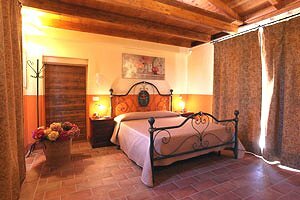 The complex consists of four apartments distributed in two buildings; in total it can accommodate 16+8 guests in 8 double bedrooms and 4 double sofa beds; it has 6 bathrooms and 1 half bathroom. 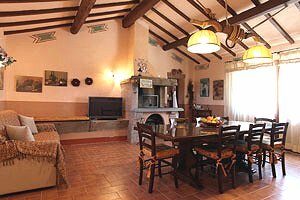 The apartment on the ground floor of the villa composes of kitchen, double living room/dining room with two double sofa bed, two double bedrooms and two bathrooms (one with a whirlpool bathtub and one with shower). 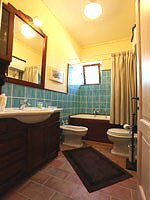 On the ground floor is also a second apartment with kitchen corner, double bed and a bathroom with shower and bathtub. 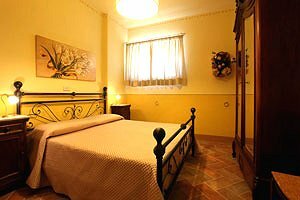 On the first floor there is an apartament composed of kitchen/living/dining room with a double sofa bed, three double bedrooms and two bathrooms (one with whirlpool bathtub and one with shower). 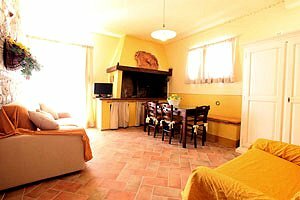 The fourth apartment is situated in an independent building and consists of kitchen, living room with fireplace and double sofa bed, storeroom, two double bedrooms (one with an ensuite half bathroom with bathtub and washbasin) and a bathroom with shower. 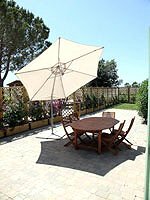 The villa comes with swimming pool, barbecue, outdoor stereo system, working fireplaces, air conditioning, air purifying system, Internet connection (both indoor and outdoor), satellite TV, DVD player, whirlpool bathtubs, electric oven, microwave oven, dishwasher, washing machine, cot bed, safe, alarm system, bicycles and private car parking space. 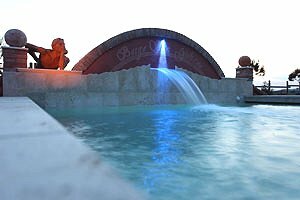 Shops and services of any kind are 2.5 kilometres from the villa. 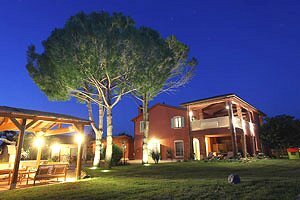 A golf club and a riding stable are within 16 kilometres from the estate. 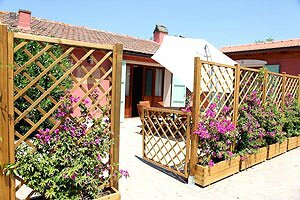 The beaches of Castiglione della Pescaia, Marina di Grosseto and Principina a Mare are 20-25 kilometres from the property.